Did I mention that I don’t eat papayas? Absolutely detest the taste and the smell *yikes*. I know it’s a great beauty food but I just can’t bring myself to eat any. However, I don’t mind using some on my face because papayas make a great exfoliant. The thing is, since I don’t eat them, it’s quite hard to make a fresh papaya face mask. So the next alternative? 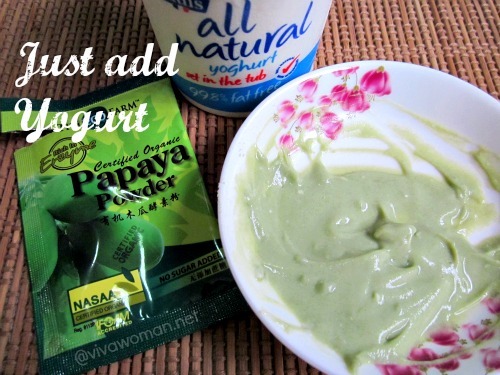 Using papaya powder! Anyway, ripe papayas are no good and so the papaya powder is handy as it is made from unripe green papayas, which contain papain, a highly potent plant enzyme. 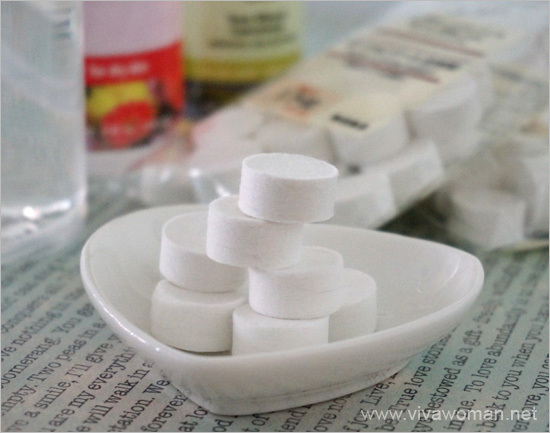 It is great for exfoliation and can help to improve skin texture overtime. You can find a number of commercial brands selling papaya face masks and I’ve tried one from Zia a few years ago. In fact, I understand papain is potent and works like Retin-A. I found the papaya powder from an organic store and decided to buy some loose packets to try. The powder is available in a bottle too and it’s actually sold as food. It has a very distinct papaya scent, which isn’t all too unpleasant. I suppose most people will find it bearable when used on the skin but I won’t say the same if it’s to be ingested from the mouth. 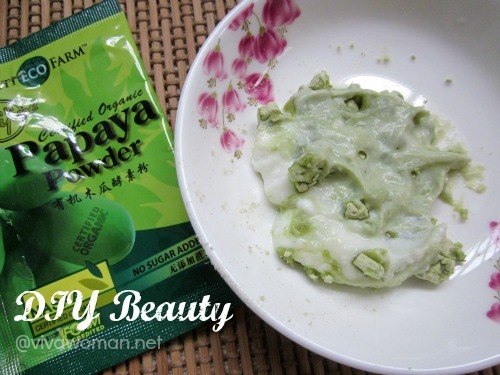 The easiest way to make this green papaya facial enzyme mask is to add yogurt or honey. Yogurt has exfoliation properties because of AHA while honey has skin hydration benefits. So depending on your needs, you can add either one or even both! Just mix the powder in, apply on cleansed skin, leave on for between 10 and 20 minutes, and then wash off and moisturize as usual. Easy peasy! 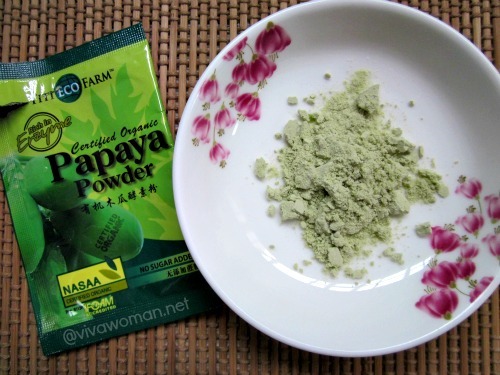 If you can get your hands on green unriped papaya or green papaya powder, I’ll recommend you to give this a try because it helps to keep your face soft and smooth! Hi Sesame, I hate the smell of papaya but have been heard of the wonders of green papaya skin (and the leaves). It’s been sold as a whitening agent..I wonder if it works? May I know where you bought yours from. I’ll definitely try it as a mask. Thanks for the article. I think it might work somewhat but may take some time. I got it from a small organic store at Hougang Ave 8. Not sure if it’s available in other organic stores. I tried ripe papaya and it didnt work for me…haha.now i know its the unripe ones that has papain..great infos and ill definitely want to try this:)anyways, where can I get that papaya powder in spore? I got it from a small organic store at Hougang Ave 8. You may have to keep an eye for it in other organic stores as I haven’t checked them out. thanks for this post. 🙂 another recipe to play with! It makes me wonder why most papaya products always use ripe papaya pictures and colors on their packaging. I wonder if they use the ripe or unripe one in the formulation. Not sure…but I suppose they should know better? I think the choice for the pic might be cos ripe papayas are more recognizable vs unripe papayas. Where did you buy the powder from? This small organic store at Hougang Ave 8. Can’t even remember the name cos I happened to be there. That so great! Thanks for this awesome info! My colleague went to Bangkok & bought some really big & sweet mangoes for me. BTW, any of your facial mask recipes using mangoes? Never tried mangoes…prefer to eat them. I guess they can be quite rich for the skin. papaya…hmm…this is something new to me! I’m a fan of fruit based face masks though, and this certainly looks promising. Definitely need to check out papaya powder. Thanks for sharing this! I really love to eat papaya because of its health benefits and it also helps in detox. I didn’t know it can become a good facial mask too! I never imagined how papaya can be turned into a mask but since you explained that you used papaya powder, I am intrigued with this product. I want to try it since you said it serves as a great moisturizer for the skin. Thanks for the tips and for sharing how to create a facial enzyme mask out of papaya, honey and yogurt mixture. It is very interesting! Natalie Vergara last post is: Multivitamin Side Effects? How would I use unripe papaya if I dont have the powdered one. How do I prepare it?